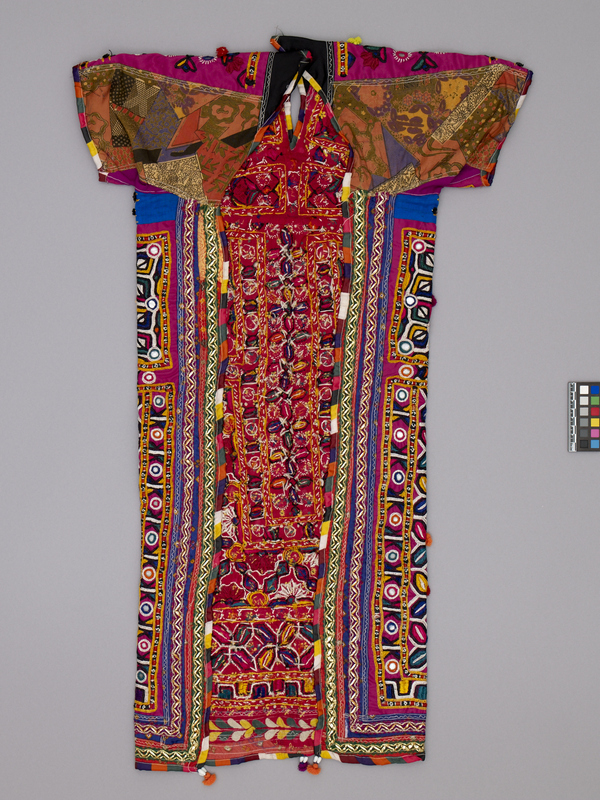 Item number 2878/59 from the MOA: University of British Columbia. Short sleeve, backless embroidered blouse with long front panel. Predominantly bright pink with multi-coloured embroidery, the central embroidered designs on the blouse are in the shape of cowrie shells. There are two square designs embroidered over the breasts. Within the square designs are smaller embroidered squares and appliqué circular mirrors. There are also cotton puffs with beads on the top in both of the squares, as well as throughout the entire design. The bottom half of the blouse has a ‘U’ shape embroidered design which includes the cowrie shell technique, rectangles with appliqué mirrors in the centre and cotton puffs. There is also a flower motif embroidered on the inside edge of the ‘U’ shape. On the sleeves of the blouse there is a shield pattern with a flower whorl embroidered in the centre of the shield. Around the shield are several cotton puffs also with beads on top. 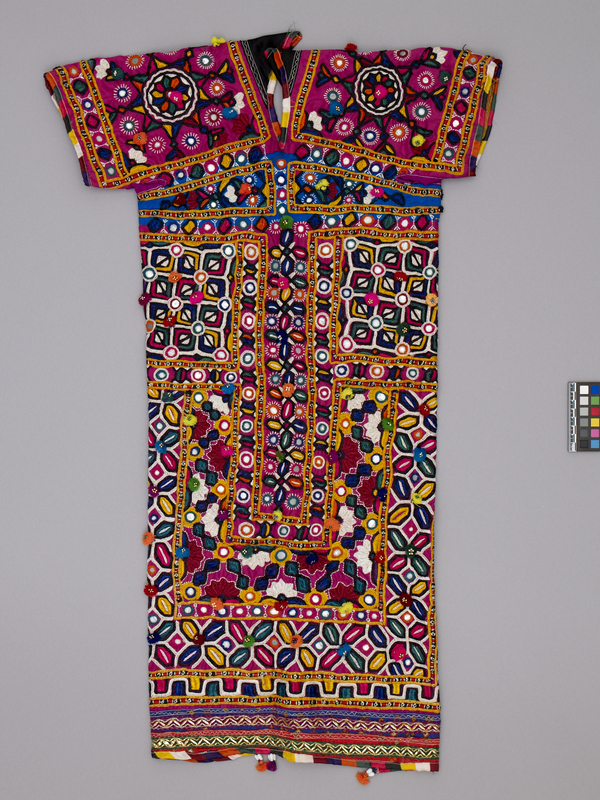 Around the outer edge of the blouse there is a coloured pattern that includes triangles embroidered from both coloured cotton thread and gold thread. To finish off the edge of the blouse there is a multi-coloured stripe. On the bottom of the blouse, in both corners and in the centre, are small tassels with shells and a cotton puff. On the back of the sleeves there is a darker multi-coloured material. The woman that made this kanjari (Sama Ben) is of the Meghwar or Meghaval clan from the Banni area of Kutch District. This kanjari was called a "mal" piece (literally "wealth") as it was intended as a dowry piece for the maker's daughters/granddaughters. The embroidery threads are coloured with analine dyes. This style of open-backed blouse is a style common to many groups in Banni but it's the style and quality of the embroidery that makes it uniquely Meghwar - bold design and colour scheme.